Jan 29, 2017: Would this be an okay set up? Feb 01, 2017: [question] Best/cheapest way to record straight into computer? Jun 25, 2017: Can I plug audio interface outputs to sound card? Sep 25, 2017: 1 XLR Mic to 2 Inputs? Oct 15, 2017: Will a better audio interface improve my audio? Dec 22, 2017: Affordable recording mic? Mar 02, 2018: I currently have $400 that I could spend on my music. What should I buy and in what order? Mar 10, 2018: Is this mic setup ok? Mar 10, 2018: Is this preamp good enough for my AT2020 mic? Apr 28, 2018: [Audio Noob Question] Looking to upgrade my computer setup. Jun 05, 2018: Does BM 800 need a sound card? Jul 17, 2018: [QUESTION] can this sound card work for guitar? Nov 25, 2018: Mic setup to stream $200 Help! Dec 08, 2018: [QUESTION] bought a USB interface, wasn't the brightest decision. Feb 04, 2019: Are cheap interfaces inadequate? Feb 06, 2019: Looking for help finding a voice recorder with good noise cancellations. Feb 12, 2019: Should I plug my headphones into my audio interface or my motherboard. Do either need an amp? Feb 14, 2019: Is the Behringer UMC-22 Audio Interface adequate for Yamaha HS8 monitors? Feb 15, 2019: My USB turntable sounds terrible when I record it in using the usb cable. Can this be remedied by using an interface to record it with line in line out? Feb 16, 2019: Please help me pick an audio interface! Mar 03, 2019: Cheapest external soundcard to use Traktor with internal mixing/recording? Mar 09, 2019: Speakers under $100 that can be also used to practice bass guitar? Mar 28, 2019: [QUESTION] Beginner recording tips? Apr 03, 2019: will Behringer U-Phoria UMC22 be enough for this? 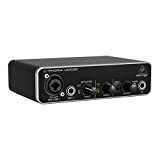 Apr 03, 2019: will Behringer U-Phoria UMC22 audio interface be strong enough for this?